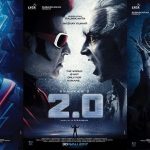 Earlier, there were reports that Kollywood’s master film-maker S. Shankar’s forthcoming science fiction film Endhiran, starring superstar Rajinikanth and Aishwarya Rai in the lead roles, will grace theatres in August. But the latest buzz is that the film will grace theatres only in September due to delay in completing post production works. Meanwhile, producer Sun Pictures are planning a grand audio launch in Dubai two weeks prior to its release. The audio launch will reportedly be a grand affair, the first of its kind in Tamil cinema. 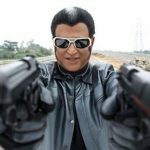 Endhiran (also spelt as Enthiran) brings back the famous duo of Superstar Rajinikanth and director Shankar after their blockbuster Sivaji the boss. The movie will also see Aishwarya Rai after a long gap in Tamil paired opposite our superstar. Endhiran is also special for its choreography by Prabhu Deva. Lyrics by Vairamuthu, art direction by Sabu Cyril and cinematography by Ratnavelu comprise a regular Shankar team. The director has also roped in Oscar winner Resul Pookutty for sound effects; it is also said that a unique sound effect has been created for the film. 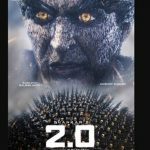 I was probably amongst the first set of people in the world other the Enthiran crew to watch the movie one day prior to official launch. Yes in Dubai on Thursday morning 7 30 AM….. Goes a long way to show my loyalty to Rajni & Shankar…. I really had expected that the movie may not live up to the mega hype created pre release. I was wrong…there has been a tremendous effort to make it a movie to remember…. I am not a review writer so I would like to give you bullet points……. I give you all the plusses…first. 1. Production value is tremendous…Transformer like special effects never before seen in Indian movies. 2. 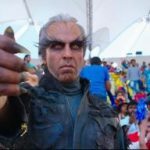 Shankar has tried to show Rajni smart throughout the movie…given thalaivar’s age, that is a big task…he has suceeded 9 out of 10 times…. 3. The robot scenes are very interesting in the first half …the saloon scene where Robot finishes the telephone directory fast and reels out names and numbers…. 6. music and song sequences are blemishless…though Kilimanjaro could have been more imaginative. 1. Second half toooo long should have been pruned.